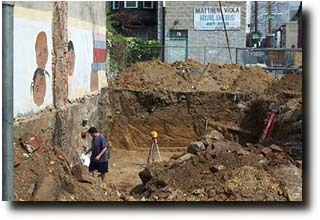 Epilogue: The garden is no more.Construction began on a luxury townhome August 2004. It's now on the market for $595,000. You may have read about Michelle Cutner in the papers if you were a Philadelphia-area resident in the mid-1990s; or you may have read her story in Buzz Bissinger's book, A Prayer for the City. On June 29, 1994, the six-year-old girl was killed by a stray bullet in front of a variety store at 20th and Carpenter Streets. After her death, her teacher and her classmates began a garden in this vacant lot across the street from the Chester A. Arthur Elementary School. But the effort had been abandoned by the time we moved into the neighborhood in 1996. 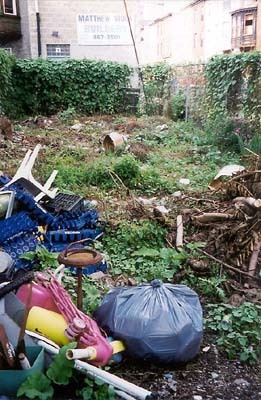 Although groups of neighbors periodically cleaned the lot of trash and weeds, they eventually became discouraged. 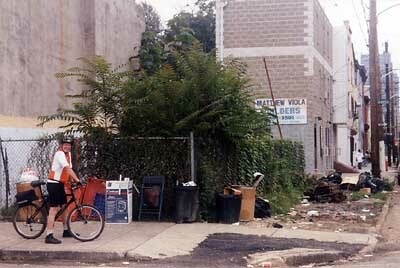 By the summer of 2000 the lot was not only an eyesore but also a health hazard, attracting flies, rats, and mosquitos. We have a garden plot in the nearby community garden and one day I remarked to the garden's leader that I wondered who had a key to the gate for that lot -- I'd like to help clean it up. She smiled and removed a key from her ring, and I found myself with a project. 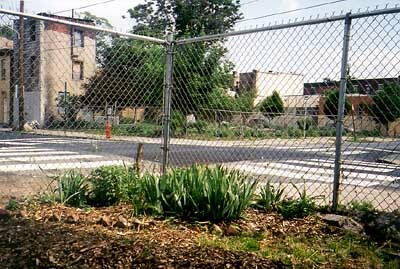 This is a view of the "garden" in July 2000. 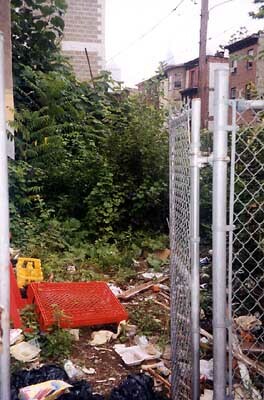 We don't have any true "before" photos -- when we started, the vegetation crowded right up against the gate. It took an hour of pushing, sawing, and pushing some more to open the gate, including sawing off a 20-foot mulberry tree at ground level to allow the gate to open fully. But before the tree could be cut I had to remove a dead cat and spread plastic bags on the ground -- to sever the 4" stump at ground level it was necessary to lie down. This particular shot shows the lot after two weekends' work on it. 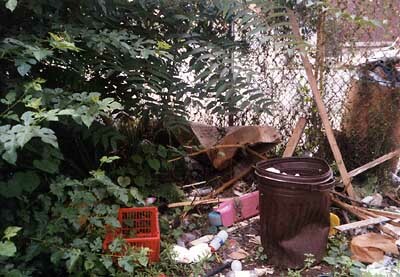 As quickly as we would remove trash and vegetation more food wrappers would be thrown over the fence. 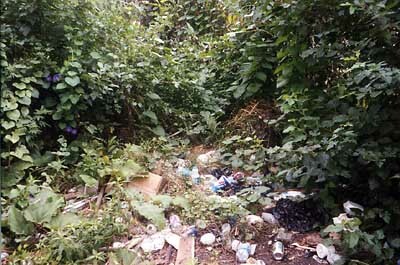 Cutting down vegetation revealed a discouraging underlayer of construction waste, cans, bottles, soggy disposable diapers, and the bodies of several more small dead animals. At times, it seemed that as fast as we removed a layer of trash another one sprang up in its place. 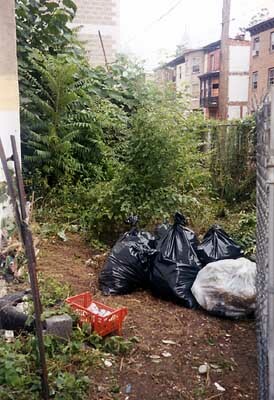 When the trees and trash shown here were removed, we found the remains of a small triangular garden bed. A few brave bearded iris, the common blue flag, struggled to survive under the shade of mulberries and ailanthus. They bloomed riotously in spring 2001. This is a view of the lot after the second or third weekend of work. We were clearing from the front to the back. We stored our trash inside the lot, because keeping trash outside the lot would encourage more of the short-dumping shown below. The view outside the lot was equally discouraging. Here Roy Blanchard surveys the collection of objects we'd removed to give us room to work, along with a pile of short-dumped trash at the far end of the walkway.Behind the lot is an alleyway that gives access to the backs of the houses on Catharine Street and St. Albans Street, making it an especailly attractive target for neighboring short-dumpers. The view of the trash from the other side. This was once a brick walkway but most of the bricks are long-gone. The school crossing guard who stands on the other corner asked the principal to petition City Council to pour a new sidewalk. I may get together a formal petition this summer and ask the neighbors to sign it. 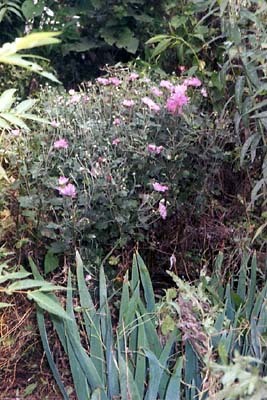 A few survivors of the lot's earlier life as a garden space began to emerge. Here, one of the two remaining chrysanthemums blooms along the cyclone fence, with iris leaves in the foreground. It gave us some satisfaction to clear the thistles and bindweed away from these two ornamentals. Finding these two plants, plus a second chrysanthemum toward the back of the lot and the iris in the triangular bed, led us to consider dividing the large clumps once the lot was cleared. No more Mr. Nice Guy! The lot, mid-September. Our neighbors Peter and Virginia went through the lot with a pair of machetes and determination one weekend and leveled the vegetation. Toward the right, if you look hard, you can see the chrysanthemum blooming; further back is the second chrysanthemum, which bloomed somewhat later with flowers the color of butterscotch pudding. Leveling the vegetation was one thing, cleaning it up was another. We removed the largest objects and arranged for a bulk pickup. We separated out the compostable weeds from the tree branches, bundling the latter into manageable bunches tied with twine for curbside pickup. Over the course of the winter we picked up the trash perhaps once every two weeks to keep it from becoming a short-dumping site again, but we deferred the real cleanup until spring 2001. But we took some time to restore the triangular bed and planted it with daylilies and sedums donated by the community garden, a few stray impatiens plants, some divisions from the two chrysanthemums, and an assortment of spring-flowering bulbs. Interestingly, we found that the amount of trash thrown over the fence dropped off sharply once we planted a few flowers. May, 2001. With the help of the neighborhood children, we have completed the clearing of the lot, dug a border along the long side, facing the sidewalk, and planted a variety of donated plants or things I have started from seed -- with a few purchased begonias to provide some instant gratification. We're expecting sunflowers to sprout any day. In the meantime, we continue to battle bindweed and thistles. We have one unsightly pile of weeds that will eventually become compost and are considering building a small fenced area to hide it as well as our trash cans and bags. 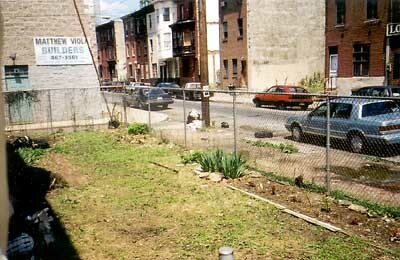 With the sidewalk cleared of trash and the weeds trimmed, the area is attracting less short-dumping. Some of the residents of nearby St. Albans Street still bring bundled trash to the far corner, but the quantity appears to be diminishing. The missing bricks and paving constitute a hazard of another kind. 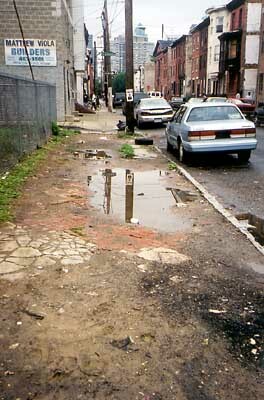 Pedestrians wishing to reach the Chester A. Arthur School from the north must detour around the puddles or walk in the middle of the street. 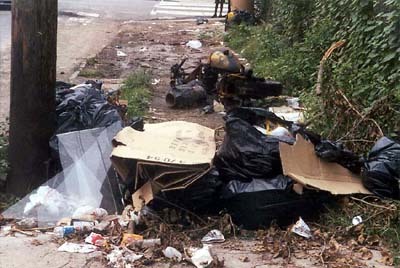 In windy weather after a rain, trash blows into the puddles and becomes soggy and difficult to collect. With the assistance of the school crossing guard, we have collected well over 200 signatures of area residents, parents of Chester Arthur schoolchildren, and faculty/staff at the school. We will be petitioning City Council to pour new concrete sidewalk along this lot. Although nothing is blooming in the small triangular bed at the moment except a few pansies, this view of a portion of the lot, with the community garden shown in the background, offers a glimpse of what a pleasant corner this has the potential to be. Our youngsters deserve to have clean, well-maintained properties and lots around their schools. How else will they learn the value of achievement? We are encouraged by the fact that the neighbors are no longer calling this space the lot, but instead are calling it the garden.